Executive Summary: Intel takes very seriously the allegations that metals (gold, tantalum, tin, and tungsten) mined in the Democratic Republic of the Congo (DRC) might be used in the electronics supply chain, and that profits from the sale of these metals may be fueling human rights atrocities in the eastern region of the DRC. The ...issue of conflict minerals from the DRC used in the electronics and other industries is extremely complex, and resolution will require the commitment and cooperation of businesses, governments, development agencies, and non-governmental organizations (NGOs). We expect our suppliers to source only materials from environmentally and socially responsible suppliers. However, due to the complexities of the metals supply chain, we are currently unable to verify the origin of all of the metals used in our products. Despite these challenges, we continue to work diligently to put the systems and processes in place that will enable us, with a high degree of confidence, to declare that our products are conflict-free. Our efforts on conflict minerals are focused in three main areas: (1) driving accountability and ownership within our own supply chain through smelter reviews and validation audits; (2) partnering with key industry associations, including the Electronic Industry Citizenship Coalition (EICC) and the Global e-Sustainability Initiative (GeSI); and (3) working with both governmental agencies and NGOs to achieve in-region sourcing. 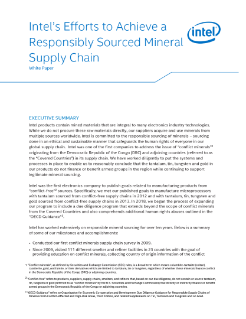 Read the full Conflict-Free Supply Chain Summary.